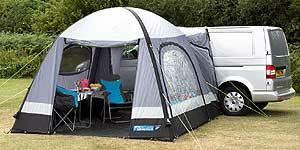 Caravans and motorhomes are not the only vehicles that people want to attach awnings to - very far from it. 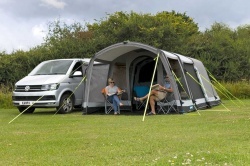 We have called this selection of awnings 'Campervan Awnings', but we could just as well have called it Car Awnings, SUV Awnings, Van Awnings or even Awnings for Bongos. 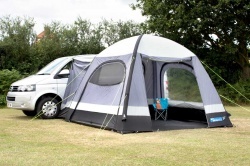 The greater variation in vehicle shapes, from large SUV's ( sport utility vehicles ), estate cars to converted vans and campervans, demands greater flexibility from the awning with respect to how it will fit the vehicle - therefore many of the awnings have universal fitting sleeves or tunnels to cater for this. 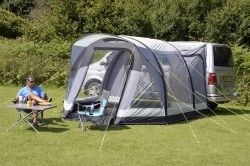 Does the awning need to fit to the tail of the vehicle or over a side opening sliding door - you will find awnings here to meet any of these requirements. 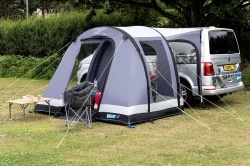 Additionally the flexibility in fitting methods is also important and many of the awnings provide more than just one method of how you can secure the awning to the vehicle. 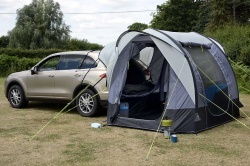 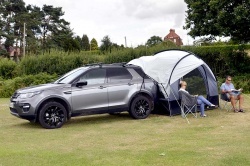 You may also want the freedom of a 'freestanding' or 'driveaway' awning that releases your vehicle and enables you to take a trip-out whilst leaving the awning back at your campsite. 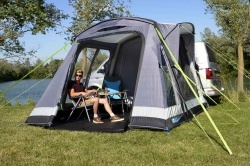 Many of the Kampa awnings can be attached to the your vehicle by no less than four different methods giving them excellent versatility and providing you with greater choice. 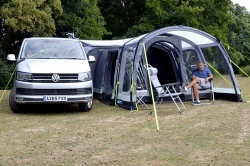 Do check the specific product you are interested in to see what methods of attachment it offers and whether you need to purchase any optional extras.